The thing that has taken our office by storm this week is our latest promotion – This Cup. Not being a marketing type person, I’m not going to use this blog to rave about the brilliance of the idea – you can check it out for yourself if you’re interested. My reason for bringing it up is because the way it came about is something that we can all learn from. I was sitting in the office a few weeks ago when one of our accountants came down and said “Hey, we should do some kind of marketing thing around that soccer fest over in Africa” and then walked out. 5 minutes later the marketing guys disappeared for an emergency meeting. 15 minutes later they emerged looking excited. A week later we were ready to go with This Cup. It’s this ‘take an idea and run with it’ attitude at SitePoint that makes it such an exciting place to work. Everyone gets in on something and works their area of the business to get it up and running. Sometimes the ideas work better than others. If the amount of responses I’m seeing over Twitter are anything to go by, this one is a winner. Aside from a willingness to try new things, a business has to allow individuals to have the power and autonomy to make their own decisions in their own areas. Enforcing stringent signing off procedures and creating bureaucratic red tape is a sure way to quell the excitement and buy in that is necessary to get something fun off the ground. Having come from a large corporate, I know this all too well. Anyway, enough with other people’s ideas and on to some of my own. With the t-shirt competition done and dusted, I’ve turned the winning designs into something wearable and we have the first samples being printed now. As soon as we’ve quality checked them I’ll have something for you to get your hands on. I can’t wait! Another thing that I’m pretty excited about that’s going on at the SitePoint forums at the moment is our Great Photography Competition. If photography is your thing, it’s not to late to join in. The first subjects have been announced and submission begins this afternoon. There are some great prizes up for grabs, so don’t miss out! In the Content Writing forum this week they are discussing a topic that every freelancer will come up against at least once in their career. How do you handle a client that won’t front up with content? There is a thread in Accessibility and Usability discussing our latest article, Help! User Documentation That Works. It probably goes without saying, but it’s all about the dos and don’ts of writing good user documentation. 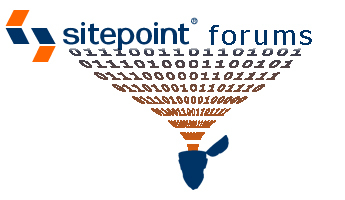 While it may not seem that general to many of you, the subject of character transcoding through AJAX is currently a hot topic over in the General Development Issues forum. And finally for this week, in General Chat there is a hot debate raging over the way Google deal with the threading of conversations in Gmail. How do you feel about threading? Well that’s it from me this week. Over ‘n’ out.